This page will grow over time. Currently, there isn't much to see! 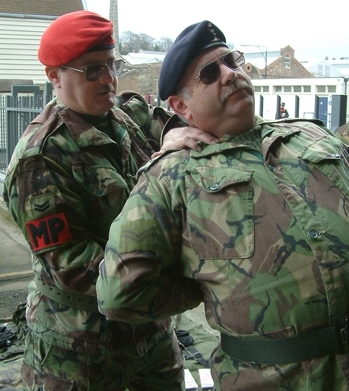 "Cpl Stenning demonstrating the new Vulcan Nerve Pinch Detention Technique on an offender"
Note that Cpl Stenning is wearing a 58 webbing belt around his jacket, whereas Cpl Oliver is wearing the later issue Belt, Working, Plastic. 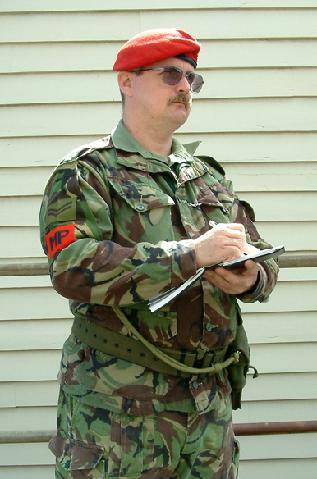 "Note taking following a minor traffic collision"
Note pistol and holster on the left, lanyard over right shoulder, whistle in left chest pocket of jacket with chain threaded through button hole level with pocket top, then hidden from view to lock about a button lower down the chest. Also, while a shirt is worn, the collar is only folded over the jacket collar in summer. 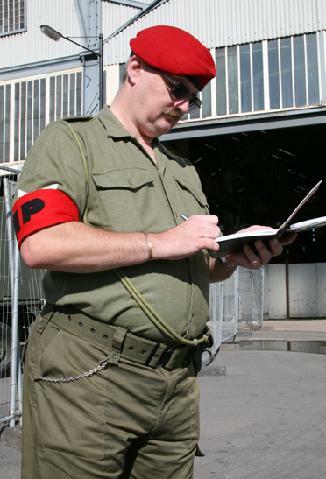 "Taking notes at a routine stop (offenders off camera)"
Note whistle is now in right trouser pocket, chain looped through belt-loop button fixing. 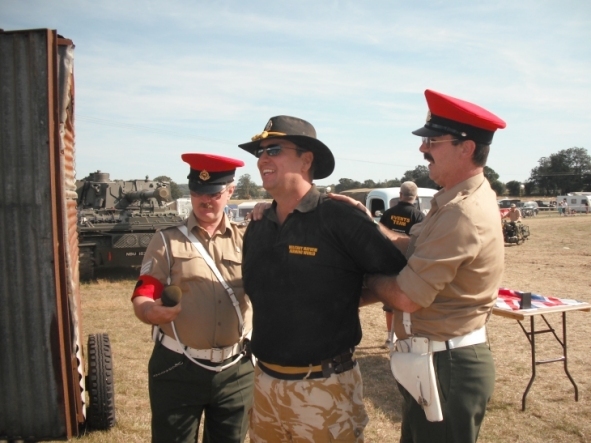 "Yes, young man, I'm a Redcap, here to bellow point-blank using parade-ground volume at unsuspecting squaddies right ear-holes!" Note shoulder titles (staybrite) on jersey epaulettes; shirt underneath also has them fitted. 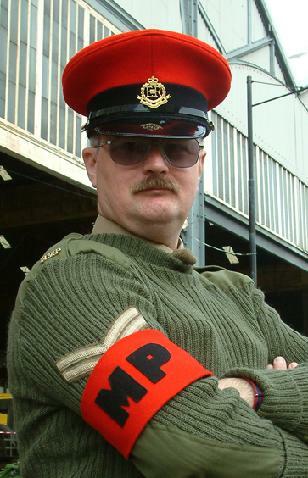 Corporal tapes in correct place on right arm only, as per uniform regulations (Note alsothe tie, which has been pushed out above the Jersey heavy Wool's neck line to the level of the bottom of the tie knot - depending on your unit depended how some of the kit was worn - it was even, often, down to how your RSM viewed the wearing of uniform!). 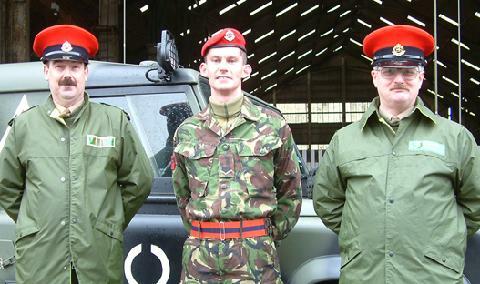 Simulated Cpls Ives (left) and Stenning (right) with Recent Military History Re-Enactor Simulated L/Cpl Stevens (centre). David's a little bleary-eyed, seems he had a rather late night and no coffee yet (hence Sim'd Cpl Stennings' evil grin)! 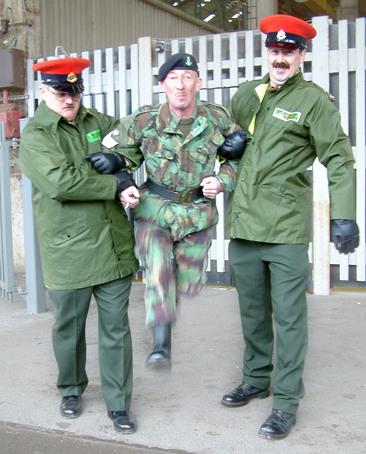 "HONEST LADS - I WUZ NICKED BY TWENTY TEN FOOT TALL MONKEYS!" "That wuz me shin you 'orrible Green Howards FING!" "End Of Term" photo - all the various re-enactors that tend to turn up regularly at Chatham. A contrived and posed photo late on the Sunday, after a rather tiring couple of days directing traffic and answering the General Publics Questions ("Yes, Ma'am, the toilets are all the way over there... yes. By the big load of scaffolding disguised as an aerial mast... no, I don't think it requires a ten pence piece"), a little light relief: "Little and large", we thought. 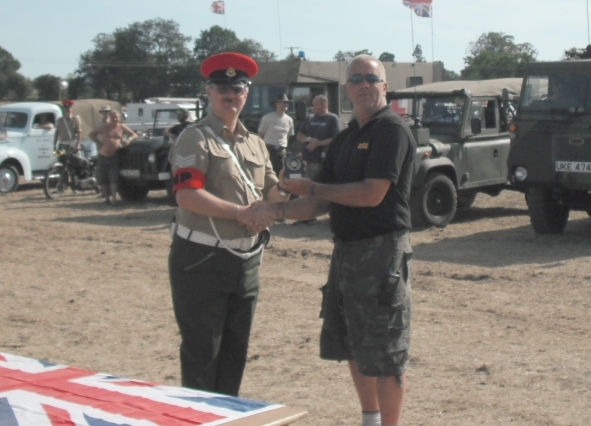 instead, we got Christened "118-118" by the lads and lasses of the Historic Military Vehicle Trust! 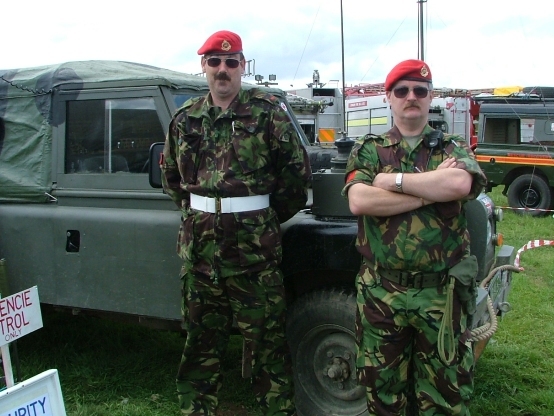 Ooooh, we'll 'ave you, and yer little Land Rover, too! Displaying a skeleton stand (due to a new land rover without a NATO trailer hitch for the usual trailer-load of kit! 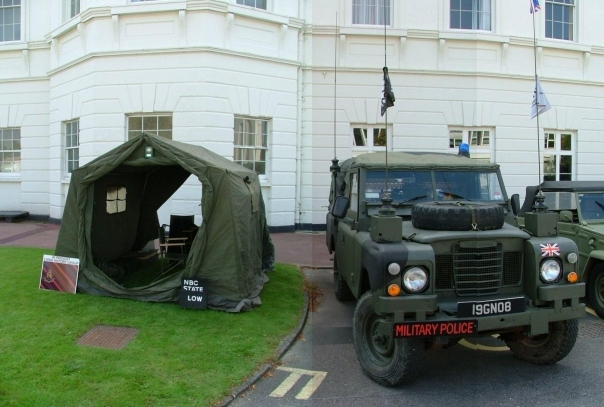 ), the Southwick Park event gave a taste of what Cold War Provost is capable of putting up! 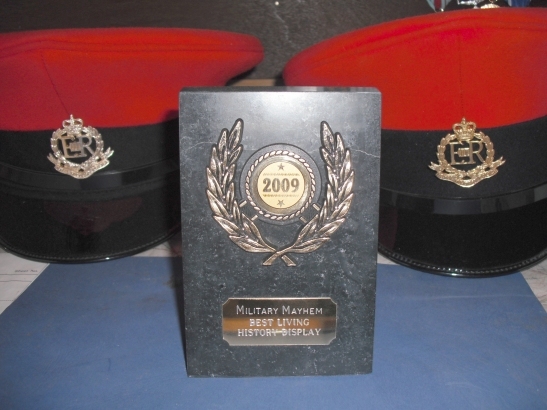 Well, we won again - this time for Best Living History Display 2009! Sim/Sgt Stenning: "OK, now we've nicked him for breathing in a public place, where the hell do I stick this microphone, Dave?" Sim/Cpl Ives: "Um... is that a leading question, Sergeant?" Victim: NO! Don't even think about it!